In commemoration of World Autism Acceptance Month, Autism Society Philippines Sta Rosa Chapter held various activities on 18 April 2015 at SM Sta Rosa. 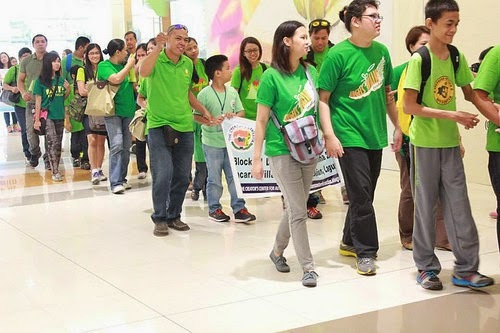 The day started with an Autism Walk inside SM Sta Rosa Mall, a first for ASP Sta Rosa! We started with an opening song "Heal our Land", beautifully sung by one of our angels, Trisha Angelica Cardino. After the walk, the exhibit where artworks of our talented persons with autism are displayed was formally opened, with SM Sta Rosa Mall Manager Marius Cortez, ASP Sta Rosa President Olive Medina and some of the exhibitors cutting the ceremonial ribbon. This is the second year we are doing our art exhibit at SM. This years exhibitors are: Caryll Angela Alvarez, Lorenzo Miguel Medina, Justin Erolin, Giannelle Amandy, DJ De Jesus, Lauriel Lambon, Ethan Zamora, Paolo Mendoza, Matthew Romero, Sean Tiu, Yshi Garcia and Jose Antonio Tan. Guests, SM managers and ASP members made their 1Pangako pledge and signed in the 1Pangako sign board. SM frontliners attended our Autism awareness orientation conducted by our very own Marigin Cinco. We are thankful to all our supporters and sponsors headed by Mayor Arlene Arcillas and Barangay Captain Aldrin Lumague. We are also thankful for the presence of ASP Binan and ASP Laguna in our activities. It is our hope that through these activities we can create a more caring and accepting society for our persons with autism. Contributor: Olive Medina is mom to CWA Enzo and his baby sister Lizzie. Aside from fulfilling her duties as a wife and mother, she works as General Manager for a logistics company, a part time college lecturer and part time yoga instructor. She is also the president of ASP Sta. Rosa Chapter.